As you well know, I love to cook. I especially love to cook soups and stews. This Christmas I was shopping for my father at Dillards near my parents house. Actually I was shopping for my mother for my father. He sent me to find her the perfect gift. And like me I knew a pan would be perfect. I found myself in the kitchen section looking for a pan for my mom when I happened upon the most glorious sight I have ever seen. I am pretty sure a light was shining down on this pot. You know like the light on the Christmas tree in the movie Christmas Vacation. This pot was made by Biltmore and it is fabulous. To be quite honest I’m not even sure how big it is, at some point I am going to fill it up just to see how much it holds. I know it looks like a small witches cauldron. But more beautiful. Oh yeah, much more beautiful. I bought that baby and quickly told my husband that he had just purchased me the best present ever. He was thrilled with his purchase. I mean some women like jewelry or other type gifts. Give me a cooking item and I will love you forever. I know I am weird. I like those girly things, but I cook every day. The cows could care less if I have a diamond bracket on. I used it to make ham and potato soup and it worked fabulous. Washed up so easily. The best part, I put 5 pounds of potatoes and close to 8 cups of water and it was maybe 3-4 inches in the pot. Not even close to the half way mark! I am dying to cook a large pot of stew soon. Now that I back in Wyoming and it is like -6 outside. I think it will happen soon. 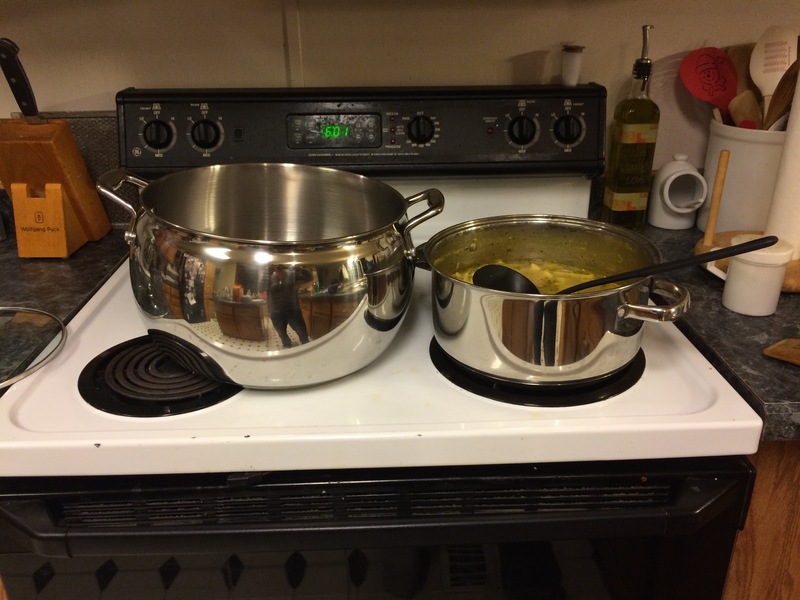 The smaller pot is my usual soup pot. It holds about 4.5 quarts. 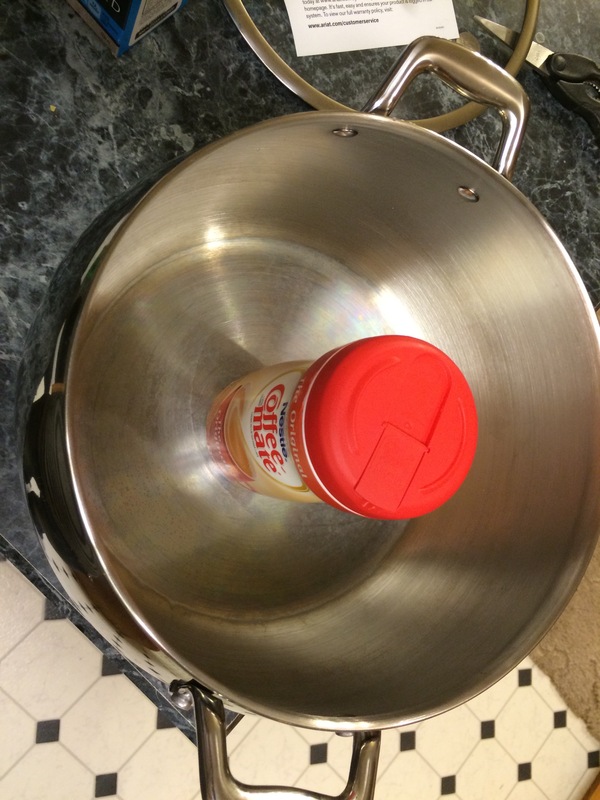 We are going to eat soup for like a year if I fill that new pot to the top. Don’t you just love pictures that you can see the photographer and all the background in. Well there I am. Next Article The Perfect Anytime Ham! So…did you find your Mom’s “perfect” Christmas gift for your Dad? I did. I got her a sweatshirt with a red cardinal. Her favorite bird and a large non stick skillet with a lid. She said ahe liked them both. I am so glad that you guys are doing well and enjoying Dru. Hopefully he will listen well as he is getting his lessons. We are sure enjoying the one that we kept this time. Smart little thing and what an awesome personality. May the new year bless you both.